Whether stone or wood, many of Marion’s most historic buildings have one thing in common: contractor Henry Kable. Kable, who had a steam-powered workshop on Sante Fe St. between 1st and Walnut Sts., was contractor for the Elgin Hotel and its adjoining historic structure, the now-promised-to-be-restored Bowron Building. He also built the also-awaiting-restoration Donaldson and Hosmer Building, the A.E. Case building that was destroyed in the Duckwalls fire in the 1960s, and the YMCA building that also was destroyed by fire in the 1950s. He also was contractor in 1893 for St. John Nepomucene Catholic Church in Pilsen. Among the dozens of other structures he built throughout the county were the 1880s Carter residence (shown here), just west of the Elgin. In the 1900s it became known as the Wheelock Rooming House and continued as an apartment building until being demolished a couple of decades ago to create a parking lot. At various times, the house and the Elgin were operated together or separately by relatives and successor owners of the two establishments. At one point there was even a skywalk between the Elgin and the A.E. Case Building, where “sample rooms” were maintained on the second floor. 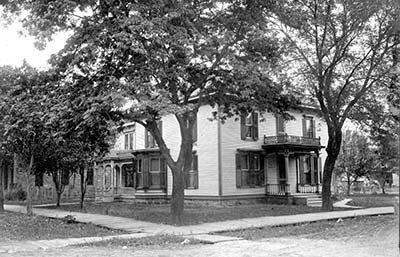 Kable, born in 1849 in Pennsylvania, moved to Marion in 1870 and lived here until shortly before his death in 1918. His shop’s steam-powered buzz saw in 1887 was a must-see attraction, and he assisted many other businesses in establishing steam power — including the Record with its new, steam-powered printing press. Among his many contracts was to build an 1891 county jail. Despite his accomplishments, county commissioners needed to be convinced to sign off on the project. “Henry, understanding human nature pretty well, loaded himself down with oranges, bananas, and cigars, and marched over to the Courthouse, thinking no doubt that he could melt the hearts of our stern board and thereby induce an amicable settlement. “But by the time Billy Evans and his second, Billy Church, got in their work on the generous donation of contractor Kable, there was mighty little left to influence anybody. “Mr. Kable was one of Marion County’s good pioneers. He was one of the most kind-hearted men. He was genial, jolly, and a practical joker. He was a great lover of children and manifested great interest in the doings of the little folks. Kable’s remains are buried at Marion Cemetery alongside those of his wife, the former “Mattie” Whipple, who died 11 years later.